2. My husband doesn’t love me any more. So You're Over Michael Kors? What Next? Hello Everyone, it's been a long while since I posted anything fashion related over in these parts but, although I don't follow trends religiously, one thing I have got a bit of a lust for is handbags. 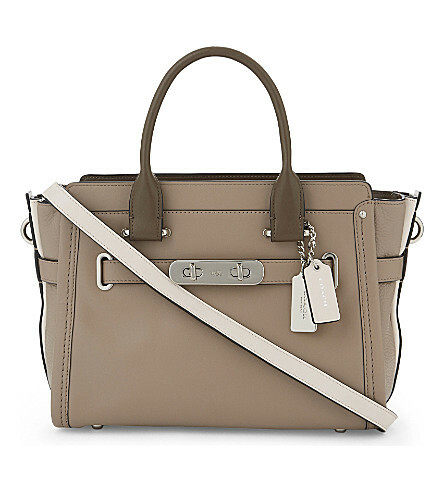 For quite a while now, Michael Kors has been dominating the scene with his gorgeous bags with a semi affordable price tag but, as time has gone by, it seems that everyone owns a MK bag, which has left some of us feeling a little 'over' the whole Michael Kors phenomenon but where does that leave us in terms of pretty and semi affordable designer bags? Well my friends, as a self confessed bag pervert, let me give you some of my favourite recommendations. 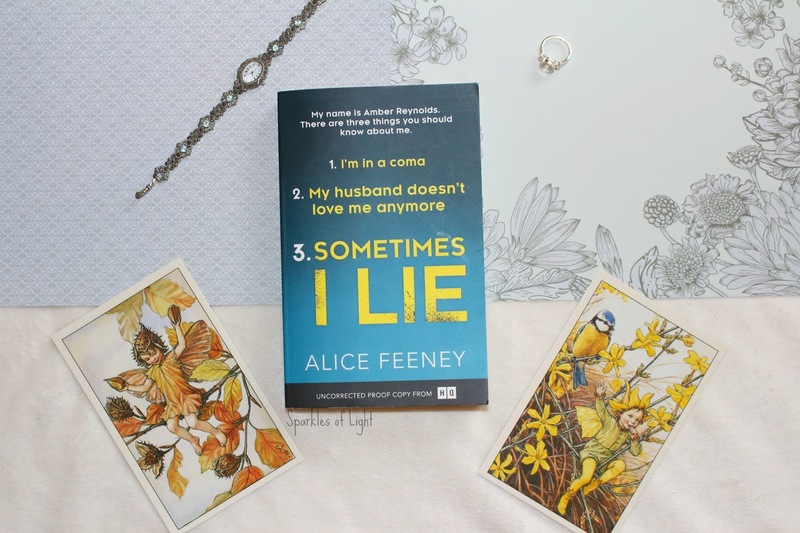 Long time no book talk (at least over here on the blog, I'm upon the book talk on my YouTube Channel) so I thought I'd pop on here with two books I've read this month, one that I really liked and one that... well... not so much. If you're a fan of The Gilmore Girls (and who isn't? ), you'll know Lauren Graham by her alter ego 'Lorelai Gilmore', the fast talking, quirky, outspoken and jazzily dressed mother of Rory Gilmore. I have been a fan of the Gilmore Girls since it came out waaaaaaaaayyyyyyyyyy back when I was a kid and, although I wasn't too blown away by the recent Netflix revival, I still watched it with all the love of a Gilmore wannabe and so when I read the tagline for this book 'From Gilmore Girls to Gilmore Girls' I was sold, the order was placed and like the little stalker I am, I waited. Annnnnddddddddd, it was a bit of a let down if I'm honest. reason I bought it in the first place. I'd really only recommend this book if you fricking love Gilmore Girls and don't mind only about two pages worth of any gossip, and even then, the gossip is like a coffee from Pret a Manger - weak. This on the other hand, this is a book worth reading. The picture may look like it hasn't been jazzed up but from the nature of the story I felt that adding blog props would be an insult, the book is about two women who have both lived in a little house in london that is infamous for it's bizarre minimalist nature and 200+ rules that must be followed in order to live there (see why blog props wouldn't be appropriate with the minimalism in this book?). As is suggested by the title, one of our females is on the current timeline and the other one is 'The Girl Before'. We are lead through a suffocating and tense journey inside a house that seems to take over your very being from the moment you are handpicked to live there by the eccentric yet charismatic architect who designed the strange living quarters. If you like a fast paced psychological thriller with a bit of an edge then this is for you as I was completely pulled into a world of mystery, fear and misunderstanding as the secrets of the house are revealed, this was a 5/5 read and I'd love to hear your thoughts on it if you do pick it up. So that's it, two books, one I'd seriously push on you all and the other... well let's just sidestep that one shall we. Let me know if you'd consider picking any of these up. What a week and a half! I've had no internet, my laptop inexplicably fell into a pool of milk and I was struck down with the illness from hell, but nevermind, I digress. 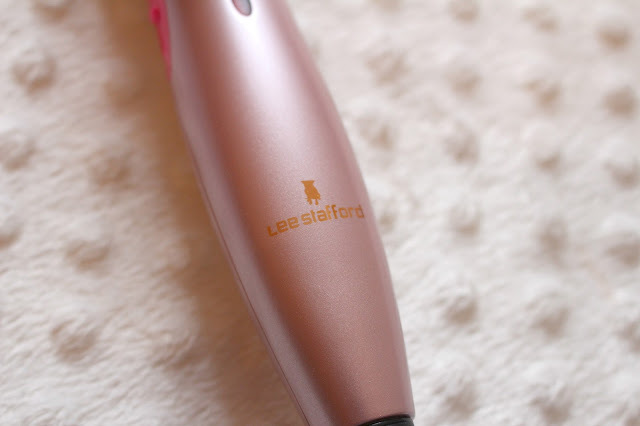 I've made it through the 1950s (as in, no internet, totally not being dramatic here) and arrived back in 2017 with my milky laptop, my bag of medicine (ref: illness from hell) and a review of my cracking new curling tong from Lee Stafford. Lee Stafford CoCo LoCo Long Tong - try saying that without smiling, it's a challenge. 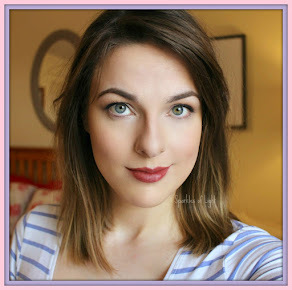 "Is that a blush pink and rose gold colour combo?" I hear you cry, yes my friends, yes it is. 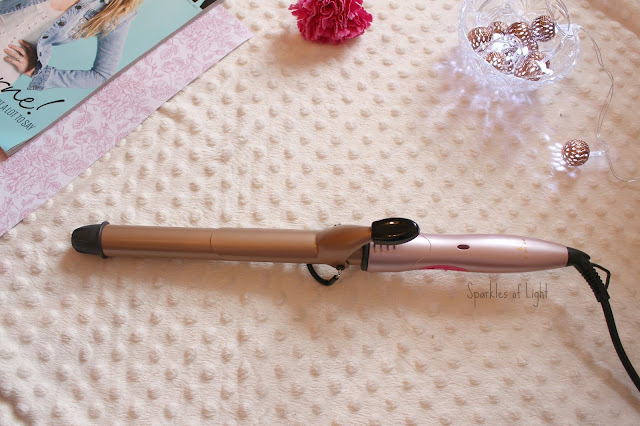 The CoCo LoCo Long Tong features a 40% longer barrel to make it even easier to curl long hair, my hair is currently pretty short so I don't have too much of a worry but when it was long last year I had endless trouble trying to find something to add a bit of curl into my normally straight hair - where were you Lee Stafford? I needed you! Now for the interesting bit, the barrel is actually infused with coconut oil that heats up when styling to give you silky soft hair at the finish, I've never heard of anything like this before so I was pretty interested to find out if it worked (ok let's be honest, I wanted to know if it smelled weird or if it made my hair sticky) I'm pleased to report there was no strange smells and my hair didn't feel coated in anything but it was pretty soft. I will say that I'm going to need more practice using the wand, it heats up to a very hot 200 degrees celsius and, as I'm a complete amature with curling wands, I had to use the clamp which I found left a strange kink in my hair on some strands, I know I used to be able to use a curling tong waaaaaaaayyyyyy back when so I'm sure I'll be able to sort out this little kink (literally) when I recall how I used to be able to wrap hair around the barrel without deploying the clamp. As you're probably aware if you come to this blog a lot, I like my hair messy, I'm not too into perfect hair so I always massively mess up any style I do and below are the results after I'd curled my hair, brushed out some of the curls (but not all... this adds to the kind of messy 'don't care' look I like) then I scrunched my hair about a bit so it was even more messy and finally I was happy, pics are below. My love for curls has been replenished and I can't wait to start curling my hair again now. The colour scheme - I mean... stunning right? The coconut oil infused barrel, could be a little gimmicky but I love me a bit of 'extra', you know? 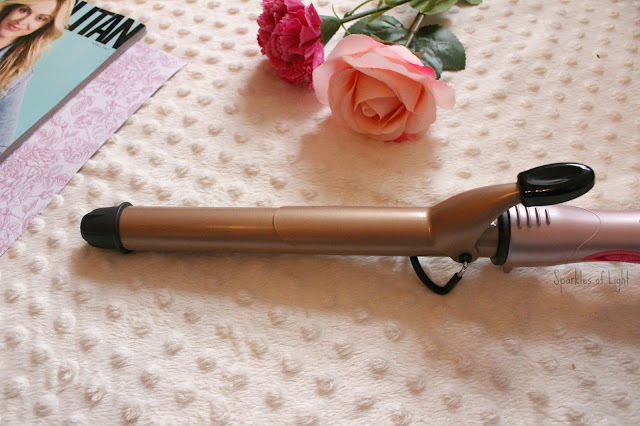 Swivel Cord - it turns as you curl your hair meaning you don't wrap yourself up as you go. It heats up really quickly. The clamp, as I said, my hair is really fine so it left a kink when I used it, I really need to remember how to wrap hair around a barrel in the mirror and cut out the clamp in the future. Overall, I've really enjoyed using this Lee Stafford CoCo LoCo Long Tong and I can't wait to keep practicing with it to get back to being the curling queen I was in my teens. You can pick this up on Amazon for £29.99 but it is currently on offer for £24.99, just a little heads up there. Will you be trying this? Do you like curly hair? Will I ever regain my skills?